Description: 26 x PICANOL OMNI air jet loom, W.W. 190CM, Y.O.C. 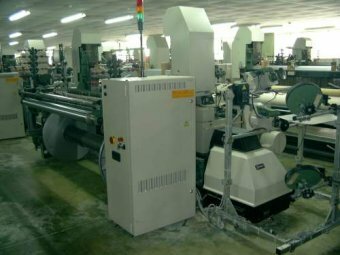 1994, 2 nozzles, Staubli 2580 Electronic Dobby (16 shafts), with Electronic let off system, Each M/C equipped with 2 weft feeders IRO 2231, 10 heddle frames, 6000 heddles & droppers, 6 warp stop bars, 1.5 warp beams (dia. 800mm), 1.5 cloth rollers, Reinforced by 2 back rollers and big surface roller for running HEAVY DENIM fabric, Looms are well maintained and are in excellent condition.